In 1975, I was 6 years old and so were the San Diego Padres. They were a young team with no major stars — except Dave Winfield. 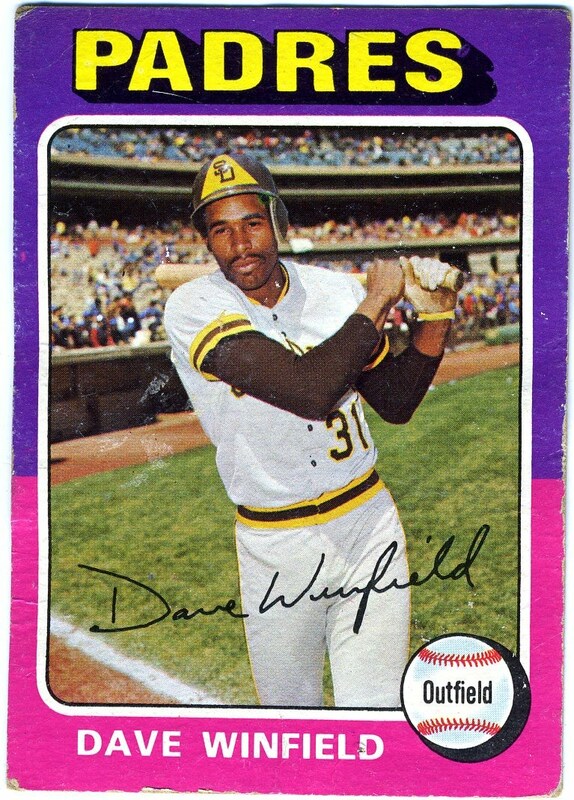 As a kid growing up in San Diego, Dave Winfield was the San Diego Padres. Really the first Padre to be considered a superstar. Sure the Padres had Nate Colbert and later Ozzie Smith and even later Tony Gwynn. But it was Winfield that I remember growing up. As far as I was concerned, this was the card to pull in 1975. It was either Winfield or Willie McCovey or Randy Jones. Even though McCovey spent 2 1/2 seasons as a Padres I always remember him more as a Giant. Jones is the first Padre to win a Cy Young award. He did so as a member of a terrible team in 1976. So I was looking through a box of beat-up cards and really wanted to pick something different for this post. This 1961 cereal card is unique enough, and then I realized this is the first mention of Gil Hodges on this blog. While I am too young to ever remember Hodges as a player, he's one of those guys you'd read about while studying baseball's heyday. I wasn't sure if I remembered him more for his numbers or the fact that he was one of the old "Boys of Summer" Brooklyn Dodgers of the 1950s. The numbers aren't bad. But then I learned of his early death at 47 and that he was beloved by teammates. A nice card of a nice player. Here's another classic baseball card that has seen better days. In 1960, Topps included only the previous year and career totals on the back of the card. Not a big fan. One of the reasons I cherish looking through old baseball cards is comparing stats through seasons. I would much rather see year-by-year totals. I would rather see how the player has progressed. I would rather see if a players great season was a fluke. I'm also not a big fan of the horizontal card. Except for the 1971 Thurman Munson. That's a beautifull baseball card. So it's been way too long since I last posted a poor old baseball card. Don't worry, I've got plenty, I just needed a little break. For those of you who are new to this blog, I started it nearly two years ago as a way to share my collection of, let's just say, non-mint baseball cards. When I was a kid, I always wanted the vintage card of Mickey Mantle or Willie Mays or even Babe Ruth. But as you would imagine, those cards were not cheap. So in order to afford my first T206 Ty Cobb, I had to buy the one with a pinhole near Cobb's forehead. Today, those cards I was buying for $20 or $30 in the 1980s are worth a bit more. To me, It was never about condition. It was more about having that little piece of history. Even today. This Otto Knabe card is actually a recent purchase. While Knabe was never in the same class at Walter Johnson or Napoleon Lajoie, he is shown here on what I consider the greatest baseball card set ever made. Plus, it's 101 years old. So check back regularly, I have many more cards to share.